Operation of underground lines has own peculiarities. The most critical element of track is the rails, in which joints are particularly stressed place. Decrease of number of bolted joints significantly reduces the probability of defect formation in the rails. Experience of the E.O. Paton Electric Welding Institute on application in Kyiv underground of a new method of rails joining, namely automatic consumable electrode electric arc bath welding, is presented. It provides high productivity of welding in comparison with alumothermal welding and required mechanical properties of the joints. Restoration of surface of the rails and parts of crossing pieces is recommend to be performed using semi-automatic arc surfacing with self-shielded flux-cored wire. 4 Ref., 1 Table, 3 Figures. Kiev metro. http://www.metro.kiev.ua [in Ukrainian]. 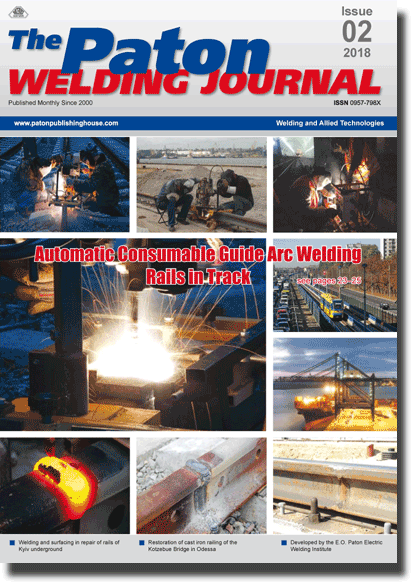 TU U 27.1-34867717-001:2012: Automatic consumable electrode arc bath welding of rail joints [in Ukrainian]. Kuzmenko, V. G., Kuzmenko, G.V., Galinich, V.I. et al. (2012) New technology of electric arc bath welding of rails on tram and crane tracks. The Paton Welding J., 5, 33–36. Krejnis, Z.L., Korshikova, N.P. (2001) Maintenance and repair of railway: Manual. Moscow, UMK MPS Russia. ISBN 5-89035-050-1 [in Russian].